Here’s another installment in mouseover poorly-thought-out design. 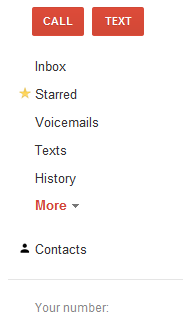 This time, we’ll visit Google Voice (a great service BTW, do yourself a favor and check it out). Oh dear, now I can’t click on “contacts”, can I? Even WORSE… if you move the mouse over there and click on “contacts” quickly, the stupid popup whips out under your mouse and grabs your click!! Now you get “recorded calls” or “Placed calls” and have to dismiss that in order to get what you really wanted. This is irritating UI design and is poorly thought out. Users shouldn’t be surprised by getting something they didn’t intend, and they shouldn’t have to creep up on menu options from the right direction in order to use them. C’mon, Google, get a clue.